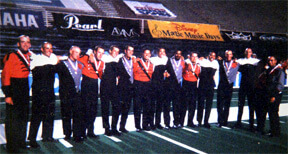 Michael Dow says: "I've been a member of the Crossmen bass line since the 2001 season. Last summer after Finals retreat, the bass lines from Crossmen, Boston Crusaders and Glassmen took this picture together. We are standing basses 1 to 5 with the 1s on the right. We all knew each other, so it was a great picture during a great night." Thanks Michael! We've run into a few technical problems recently, so if you haven't seen your Forzato Picture of the day yet, send it to us again and we'll run it as soon as we can. E-mail it to dave@dci.org along with where and when the photo was taken, and send some biographical information about yourself as well. We'll give you full credit. Also, let us know if you want your e-mail address included, to get feedback from other drum corps fans.